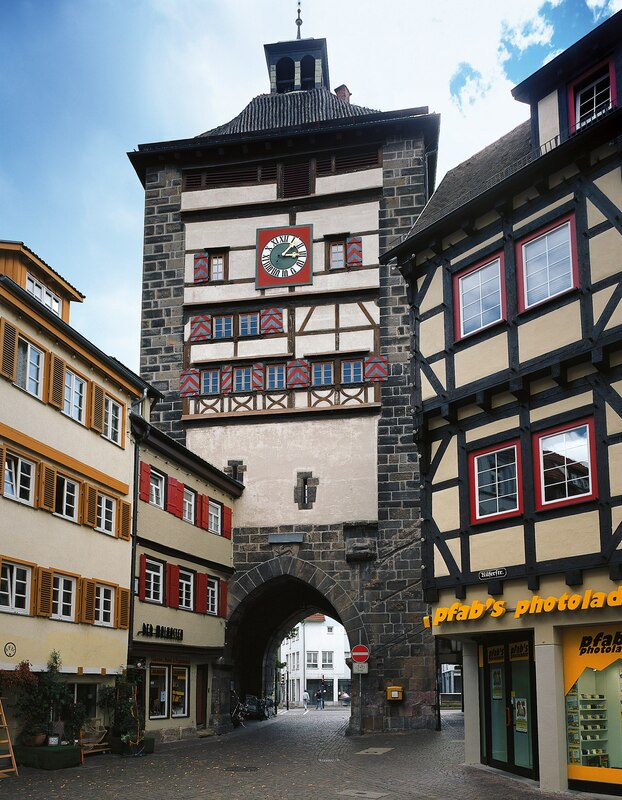 The Wolfstor Gate Tower is impressive evidence of the strong fortification of the old town. It is the oldest remaining gate tower in Esslingen and was built as part of the town wall in the first half of the 13th century. This is where the trade route from the south led into the town. The two almost life-sized stone lions above the entrance represent the Stauffer symbols of power. The smooth ashlars in the lower area are typical, as they were meant to prevent the enemy from climbing up the tower. In the upper area are the embossed ashlars which are typical for the Stauffer period. On the inside above the gate opening a relief of a wolf can be seen. The graceful bell tower was added to the gate tower in the 17th century.